Chinese New Year is just 4 weekends away. I guess it would be here in NO TIME at all. Weekend 1 would be my mum’s birthday. Weekend 2, we’ll be heading to Broga Hills for sunrise. PLease if anyone has been there before, tell me it’s not that scary to hike at 5am T__T For weekend 3, we’ll be heading to Bangkok for some serious shopping. and that’s it! By the time we come back, it’s the week of crazy cookie eating session and visiting relatives who only see you once a year ? HAHA. 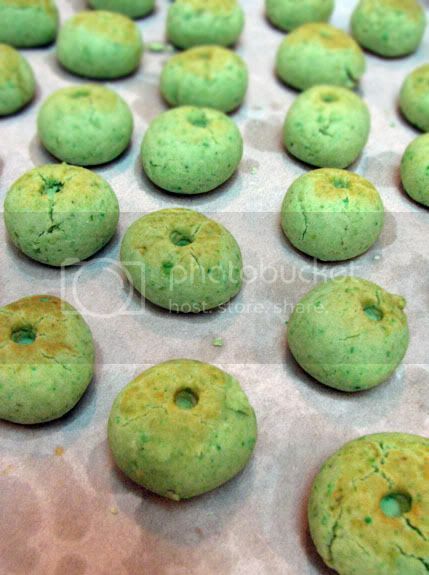 OH okay, I’m suppose to blog about these Green Pea Cookies. Measure and sift dry ingredients in a bowl. 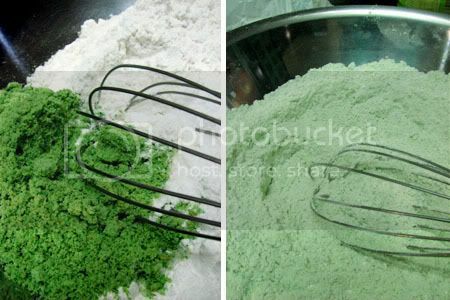 Use a whisk and combine the dry ingredients. Add in oil to the mixture and mix thoroughly till a dough / ball is form. Bake in a preheated oven of 170 C for 15 minutes or until golden brown. If using egg glaze, the browning may be more apparent than just using milk. So I left mine in the oven and increased the top heat of oven to 190 for quick browning. There are some things I found about baking these cookies. They don’t smell nice while it’s baking. Actually the smell put me off, I wondered what was going on with the cookies / oven. When it’s baked and cooled, I kept it in an air-tight container for a day to rest. Tasted the next day, it was much better than when it’s out from the oven. But I also realized that the green peas weren’t fragrant enough so the next time I make it, I’m probably going to toast them for that extra kick. Or maybe get a pack of grinded green peas from somewhere else.. 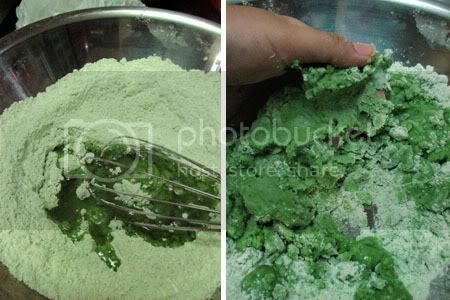 I actually use to make this for CNY, but after some time family member get tired of it and prefer the traditional peanut cookies. Swee San, thank you so much for sharing this fabulous recipe! I've already spread the word out on my blog about these addictive cookies! Thank you! 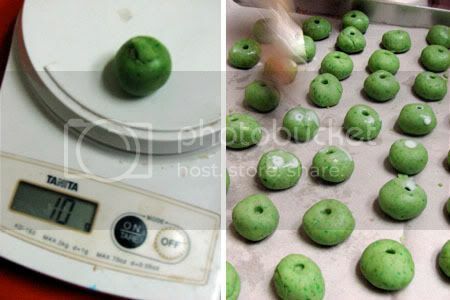 Swee San, you got this ground green pea from BS Bakery? I just bought a packet last week, thinking to try this soon.So I need to toast the green pea first? Sonia, I bought it from Kota Damansara.. It's not necessary to roast it because some maybe have roasted b4 grounding it. But I roasted mine for 10 minutes..
I’ve toasted the bought green peas flour from Bake with yen and it doesn’t have the smell and taste i wanted. IT’s the same like you said in your post.